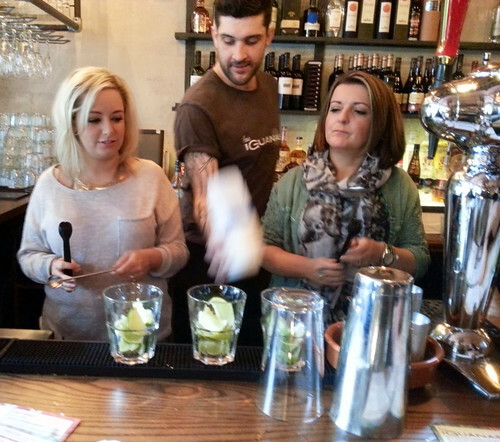 Yesterday afternoon myself and Nicola were invited along to a cocktail making masterclass at Glasgow's newest Latin American restaurant, Las Iguanas. 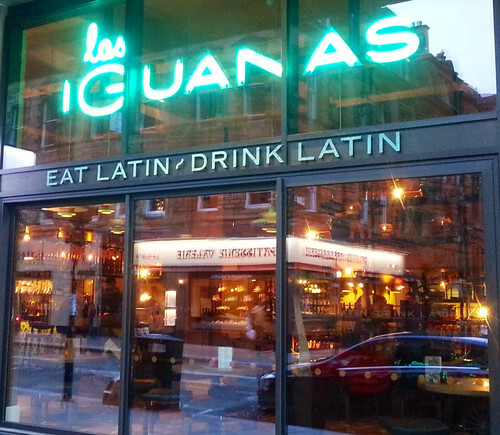 With a motto of 'Eat Latin / Drink Latin', Las Iguanas will bring a South American flavour to the streets of Glasgow, just in time for the Summer World Cup in Brazil. 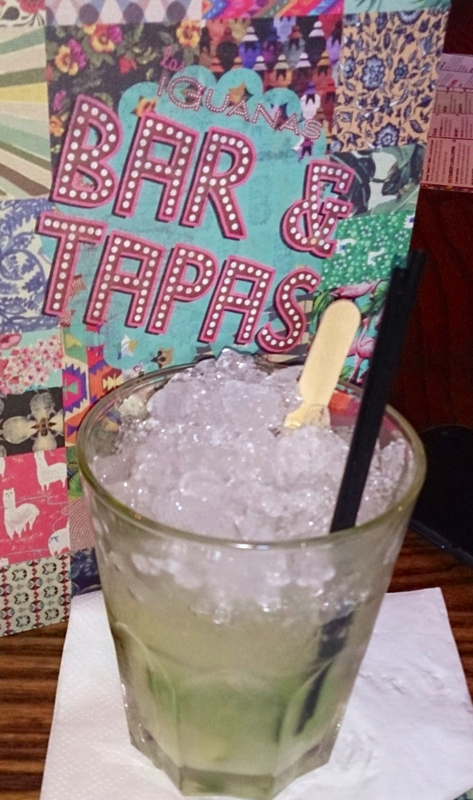 I fully intend on doing a full review on Las Iguanas Glasgow in the coming weeks so this post is just a quick flavour bite of what we got up to yesterday. 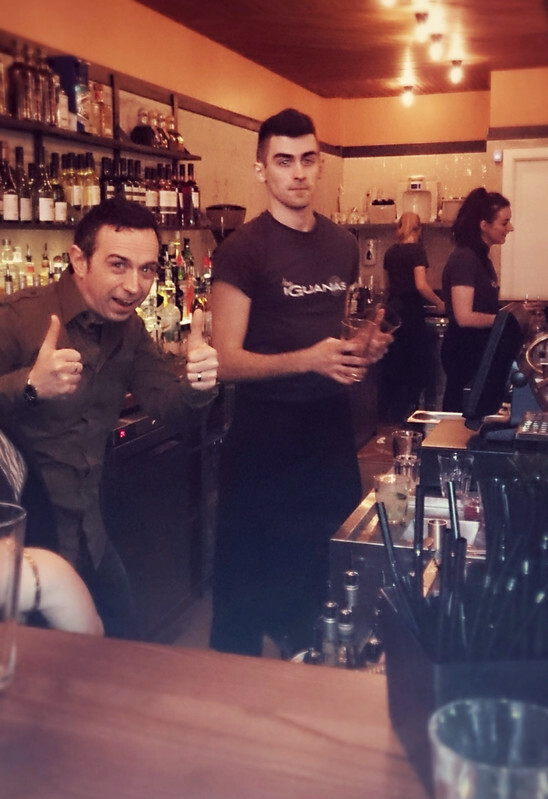 On arrival, resident bartenders Darren and Greg served up some refreshing Caipirinhas before letting us loose behind the bar. The caipirinha is the most well known drink from Brazil, made using lime, sugar and Cachaça. Las Iguanas have a number of long standing business partners in Brazil including their cachaça partners Magnifica, who grow their own organic sugar cane before mixing with fresh local spring water to create a very smooth Brazilian national drink. Nicola is joined behind the bar by Paula from The Sweet Chilli Sisters, another Glasgow food blogger. I took my turn behind the bar as I made an attempt at recreating the Las Iguanas Cosmo, a twist on the classic Cosmopolitan. I would have got on a lot better of it weren't for the giant pointy finger that was lurking about, I've been assured that it will be removed before the official opening. 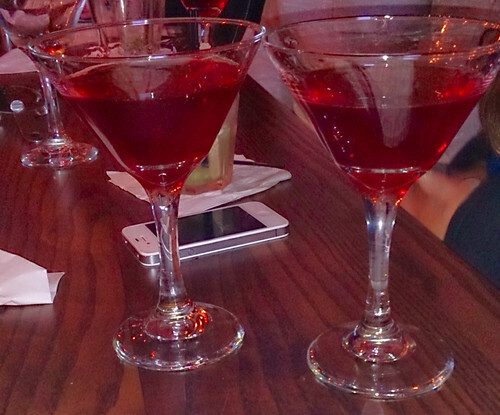 The Las Iguanas Cosmo is a blend of Absolut Acai berry vodka, Triple Sec, Grenadine & Pomegranate juice. I predict that this colourful cocktail will become a firm favourite of the Glasgow girls. The next drink that we sampled was my favourite cocktail on the day. 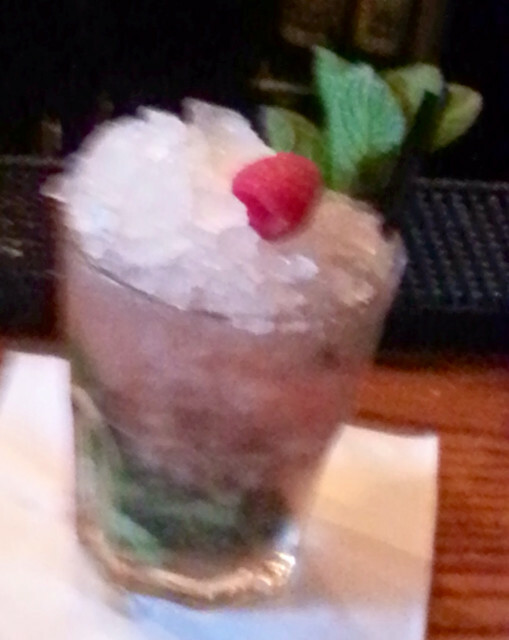 The photo may be slightly blurred but the sharp flavours from the Tequila Raspberry Smash were bang on the button. Muddled mint leaves are mixed with silver tequila, lime and framboise before being topped up with finely crushed ice. If I can count framboise as one of my 5-a-day, I can see this drink being my downfall. As our day came to an end, the kitchen served up a few of the dishes from the hugely varied menu. 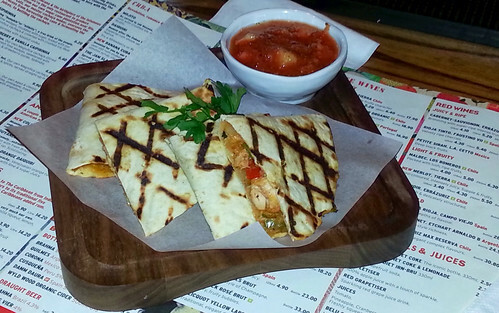 We had quesadillas, filled with chicken & peppers, plus a delicious filling of garlicky mushrooms. 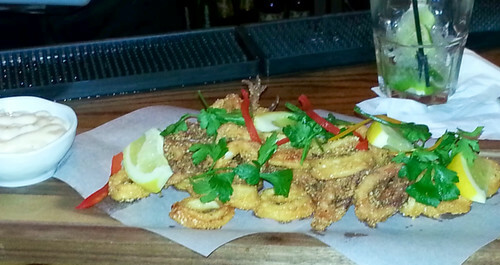 The deep fried baby squid were cooked to perfection, served with a creamy alioli. Definitely one of the best servings of calamares that I've had in a long time. Next up was smoke turkey and cheese empanadas served with a cranberry salsa. Unfortunately I didn't get to taste this dish as I was busy with the squid and everyone else had scoffed the lot before I noticed. We also had a huge bowl of nachos topped with guacamole, soured cream, salsa, and cheese, plus a wonderful plate of huge whole prawns cooked in a garlic, lemon and chili sauce. The sauce from the prawns had a wicked fiery kick - I'll be ordering these at the first chance what I get. Before we made our way out into the great outdoors, I asked if Darren could put a Brazilian twist to my favourite after dinner cocktail - the Espresso Martini. 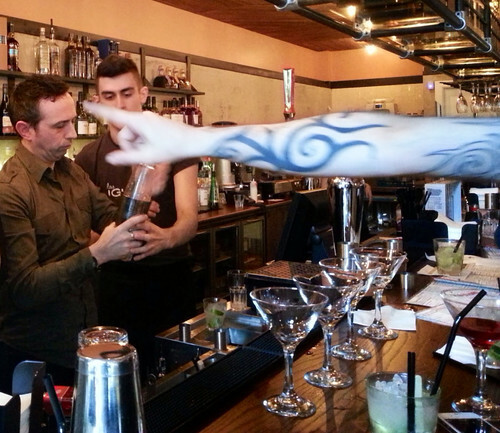 I had been thinking all week about how the martini would work with cachaça replacing the normal vodka. Darren shook a shot of espresso with brown sugar, Kahlua, and cachaça with ice before serving up my Cafe Maracana in a chilled martini glass. 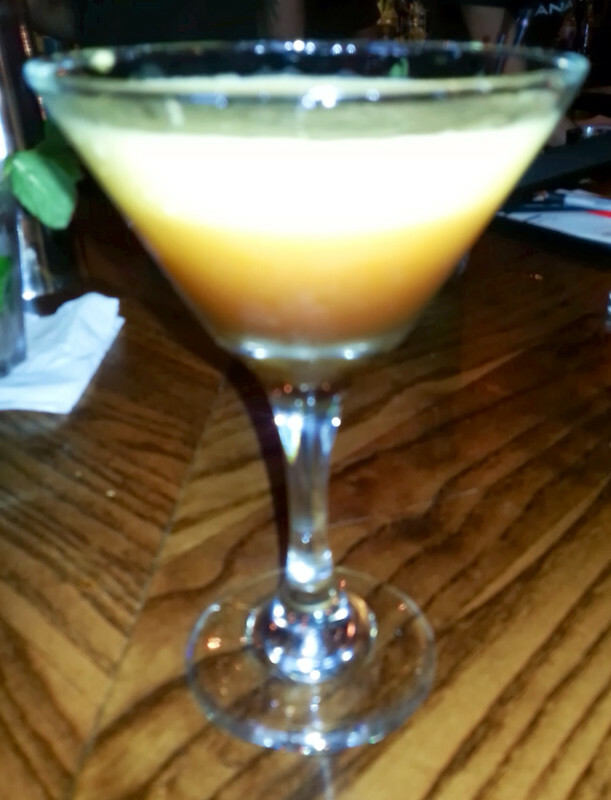 I loved this Brazilian version and with a bit of luck my create will end up on the cocktail list in the coming weeks. So at first glance, myself and Nicola loved our first experience of Las Iguanas and cannot wait to return for a proper visit. In fact, Nicola has already booked up for her next girls day out in a few weeks time! 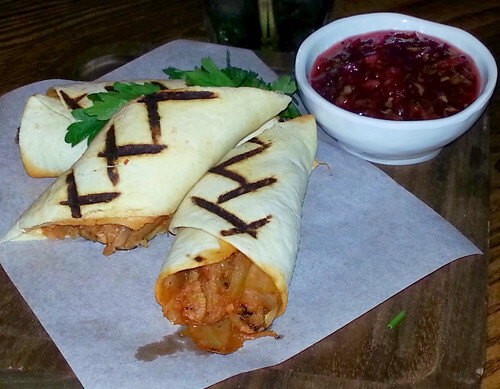 Gerry's Kitchen gives Las Iguanas 'two thumbs up'. We would like to take this time to thank Kyle Steel, the general manager, as well as Darren and Greg who were happy for us to step into their Latin Kingdom. Thanks also to the kitchen staff who prepared the wonderful tapas for us to sample. Keep an eye on Gerry's Kitchen for a full review in the coming weeks. 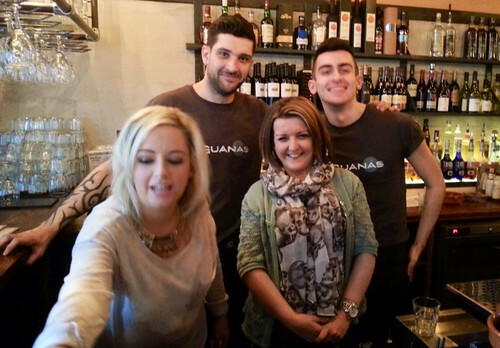 Keep up to date with Las Iguanas Glasgow on Facebook and Twitter.